Edgar Degas, "At the Races in the Country"
Edgar Degas, 1834-1917, another one of France’s famous artists in art history, never accepted all the tenants of Impressionism. He combined some of traditional characteristics of David's classicism with the looser Impressionist style. Degas sought the momentary effect in his art. Degas was interested in painting a person's character. He painted their psychological essence and personality. One of his Famous paintings, "The Bellelli Family", painted in 1859, Degas not only reflects whom the figures are in the artwork, but uses composition divisions to give clues to character. The father of the Bellelli family has an estranged emotional relationship with his family. His portrait is painted with his back to the viewer and his face in shadow. He is further set apart from his family by the one-third vertical division of the canvas utilizing the table leg, the left side of the fireplace and the frame of a mirror. Shaping the mother and daughter figures, Edgar Degas uses the triangle art form of the classical High Renaissance. The daughter's triangle form is completely inside the mother's triangle form, linking their solid personal relationship. The second daughter does not have a close relationship with either parent. Her face is turned in the direction of her father, but doesn't quite meet his glance. The similar dress uniform of each daughter unites the horizontal compositional flow of the painting, and cements the personal relationship between the two daughters. Edgar Degas sets the sad somber mood of the painting in the distant facial expression of the mother, again reflecting the deep emotional problems within the family. Through personal observation and compositional structure Degas was able to relate the private, personal, inner lives of these people in his art. By the latter 1860's, Degas recognized the true subject matter of his art interests, the functions of people in their every day lives, at home, in the café, at the opera or anywhere where people congregated. The object was to catch people in a moment of time, unaware. Edgar Degas' originality and interest in classical pictorial art discipline, is indicated in the famous painting, Foyer de la Danse", 1872. He combines the momentary action of a ballet dance class with classical static order. The dancers are static in their pose but are actively pictorially caught in a mid dance routine. The viewer knows in another instant the figure postures will change. Edgar Degas' interest compositionally in the dance classes is the unexpected angles offered by the dancers in their routines and the vantage point at which he could view them. Inside an enclosed space, the “Foyer de la Danse” composition has a classical art balance with an austere foreground and background. The originality of the artwork is the elevated oblique viewpoint and the creation of space utilizing the single chair strategically placed in the foreground. Compositionally the darkened pilaster on the back wall balances the heavy figure grouping on the right also the open door on the far left wall. The final balancing factor is the strong white lighting on all the dancers and musicians, moving horizontally across the picture plane. "Estelle Musson" was painted in 1872-1873, a portrait of Degas’ blind sister-in-law, and another example how Degas is able to capture a personality in his art. The composition is simple and plain, creating a quiet, serene mood. Estelle's face is turned directly into the light, with a vacant look reflecting her situation, drawing sympathy. The loose brush strokes give the portrait a feeling of spontaneity. Degas' famous ballet paintings were produced in great quantity in the 1870's. As a draftsman he felt oil unsuited to his linear art compositions, a technique encouraged by Dominique Ingres. Executing his art in pastels fixatives allowed Degas to draw over previous layers without smearing them, allowing for texture buildup. The ballet dancers and their studios, offered Edgar Degas everything he wanted in subject matter. The dance studios offered unusual light sources, stage floodlights, orchestra pits and props, and best of all the unusual foreshortened points of view in the dance routines. Degas combined these original innovations in art history with traditions of classical art painting. Other famous artists of this period are Mary Cassatt, Renoir, and Toulouse-Lautrec. To view gallery 1, Edgar Degas posters, click here. 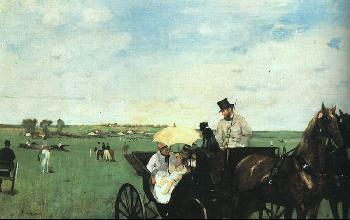 To view gallery 2, Degas paintings, click here.